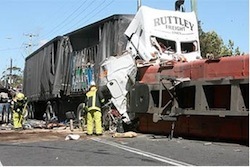 Beverly Hills Truck Accident Injury Attorney - Over 40 Years of Experience You Can Trust! Were You Hurt in a Truck Accident or Car Accident in Beverly Hills? Our Beverly Hills truck collision injury lawyers provide high quality personal injury legal services for people injured in truck accidents, including collisions involving 18 wheelers or big rigs. The firm's services extend to all the relatives and families of those killed in truck and other deadly accidents for wrongful death claims in Beverly Hills, a city located in Los Angeles County, California. If you or anyone you know has been involved in a truck accident or other personal injury claim in Beverly Hills, West Hollywood, or anywhere else in California, please contact our truck accident attorneys and law firm now for a completely FREE CONSULTATION. You may also visit our Truck Accident Web Site if you want to obtain additional helpful information about truck accident injury claims. Beverly Hills is a major tourist attraction with famous places to explore such as Rodeo Drive, which consists of luxury-goods stores extending two miles down from Wilshire Boulevard to Santa Monica Boulevard. Beverly Hills is located southwest of Hollywood and west of Los Angeles, making it a popular location for people from all over the world to come visit. Notable celebrities who have resided or are still living within Beverly Hills include Jennifer Aniston, Paris Hilton, Michael Jackson, Lisa Kudrow, Martin Lawrence, Courtney Love, Georges Marciano (founder of Guess), Alyssa Milano, Mike Myers, Matthew Perry, Brad Pitt, Winona Ryder, Eriq La Salle, Sylvester Stallone, Rod Stewart, Sharon Stone, Taylor Swift and Bruce Willis. According to the 2010 U.S. Census, Beverly Hills has a population of 34,109. Of the 3,484 large trucks involved in fatal crashes, 74 percent were combination trucks. More than 95 percent of the 9.6 million vehicles involved in motor vehicle crashes in 2010 were passenger cars or light trucks. Truck accidents can cause injuries that are often fatal to the people involved. One such serious injury is a hip fracture. Most hip fractures are caused by vehicle collisions that create high-energy trauma. A hip fracture can affect a person throughout the rest of their life by requiring surgical repair followed by months of physical therapy. If you or anyone you care about suffered any hip fracture injury from any truck collision or other personal injury accident in Beverly Hills, Los Angeles or anywhere in California, please contact us now, including for referrals to doctors who may provide treatment without requesting any payment until the claim is resolved. The Law Offices of Gary K. Walch, A Law Corp., provides you with a strong advocacy with an understanding and compassion to make this process easier for you and your family when going through a horrible truck collision or other injury accident in Beverly Hills or anywhere in California. It is our duty to best represent your interests and aggressively pursue your rights. Our law office handles accidents involving truck, car, motorcycle, bus, train, bicycle, pedestrian, hit and run, uninsured motorist (UM) and much more.